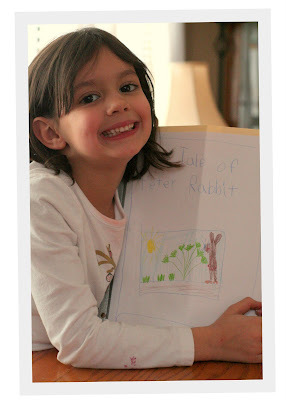 As part of our study of Great Britain we picked The Tale of Peter Rabbit by Beatrix Potter as a unit/book study. We used Five in a Row for the study and I loved it! 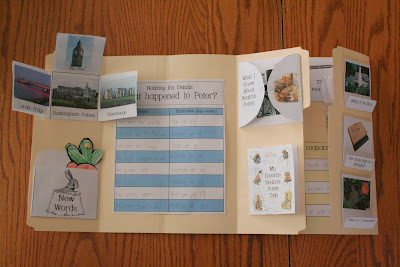 Homeschool Share has a great lapbook pdf to go along with many of the areas we studied. Math - what is a fortnight? Language Arts - vocabulary and onomatopoeia (McKenna has been having too much fun saying 'onomatopoeia' ever since...and pointing them out). I made a minit book for onomatopoeia to go along with the lapbook too. Science & Math - planning a garden. I created a grid for the girls and they made a "garden plan". 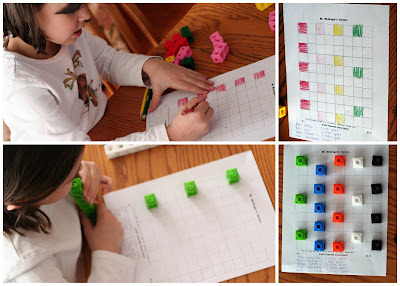 The girls picked the vegetables that they wanted to plant and then laid out their gardens using Unifex cubes. They had to space them 'x' inches apart and have rows between their plantings (pictures below). 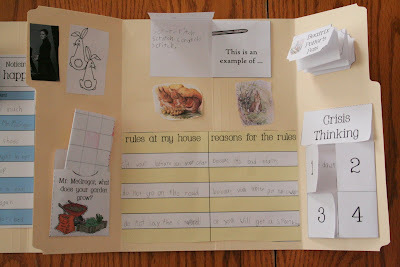 The garden planning pages are available at Homeschool Share. 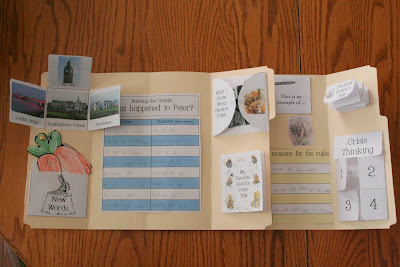 Today we put all the pieces of our lapbook together. Here's how McKenna's turned out. And just in case you can't read the apology letter that McKenna (first grade) wrote to Mr. McGregor, here is her note to him (her spelling). We put our letters on the back of the lapbook. 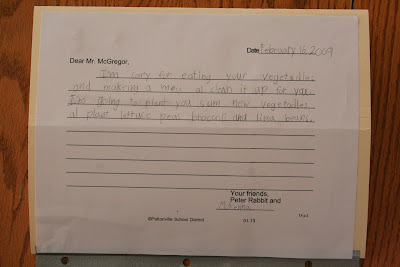 "I'm sory for eating yur vegetables and makeing a mess. Al (I'll) clean it up for you. I'm going to plant you sum new vegetables. Al (I'll) plant lettuce peas broccoli and lima beans." 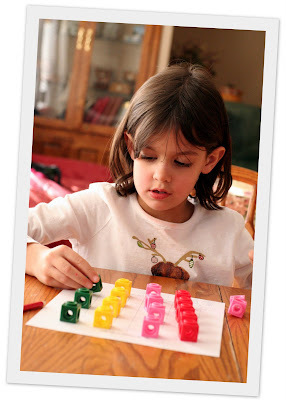 Thanks so much for sharing the resources you found and for all the pics! Fun to see what your kids are learning and creating. This unit study looks like a great one. I love Five in a Row, too, but haven't ventured into lapbooks yet. I had no idea there were so many quality free templates out there. I'm a children's author and new to blogging (about a month). I want to network with people like you. Yes, I agree with the previous commenter -- your blog is great! And your homeschool is great. I love Peter Rabbit. Adorable! 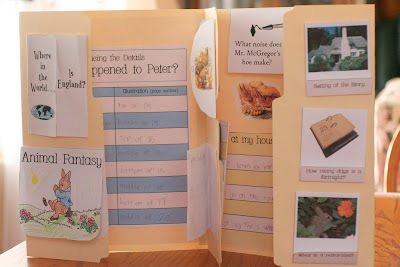 Thanks Jolanthe for sharing the documents for creating this wonderful lapbook! Someone told me Peter Rabbit is coming to the movie theater soon. This would be a great unit to study and make a lapbook with her before we see it. We have those cubes too...that's a clever use for them!